I would like to say that I have slept in some rather interesting places including the floors of Newark Airport, a room above a pub in Ireland, or an overnight train from Beijing to Xi'an, China. For those who know me they know I will sleep pretty much anywhere, but nothing compares to that of an overnight train in India. 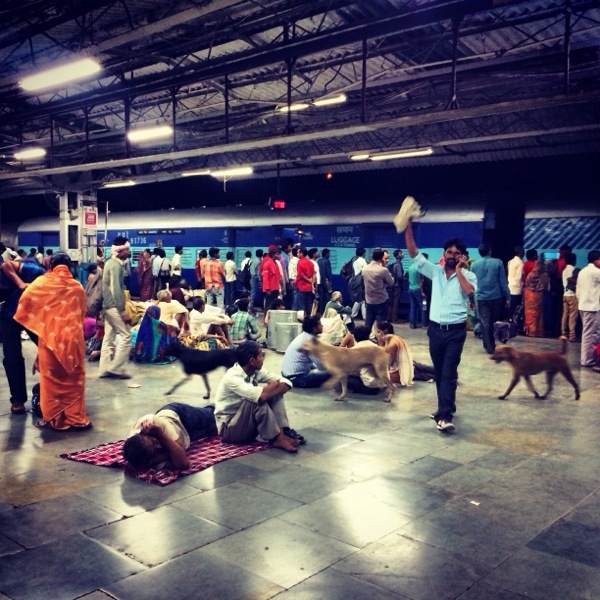 Train Station at 10:30pm filled with tons of people, cows, dogs & noise. The train station itself is out of a movie, I can imagine average train stations across the world would probably be slowing down for the evening at 10pm as the last few trains approach - which is not the case in Orchha , India. As our Tuk tuk approached the station the hustle and bustle of the night was just getting started. Hundreds upon hundreds of people gathered outside the station sleeping in rows with packed sacks of items to take back to their local villages , or the more harsh reality was because the overly populated India left these people with no where else to sleep. Of the train car) I realized there were 6 Indian men sitting across from me, barefooted - staring at me as if I were an alien from another planet. It's quite understandable considering the man to woman ratio on this train car is probably 29:5. I settled in to my middle bunk and watched as people pushed their way through to find their bed (pepper spray in hand). The light above my head flickered for hours as if I were in an underground night club in Berlin , men walked by stopping to stare, the aroma was strongly influenced by garlic, curry and body oder while the car festered at a uncomfortably warm temperature. I knew I was in for one hell of a ride when I realized this was my home for the next 15 hours as we made our way from Orchha in MP to The holy city of Varanasi. 9 hours later I woke up to an entirely different group of men sitting watching me sleep - safe to say I was mildly petrified but flashed a smile and turned around. this was certainly an experience for the books that made me not only very appreciative for the luxury of space, but it was also amazing to see a society interact in a situation that I would consider similar to that of a cattle car. Proud to say after a 4 hour delay we made it to the city of Varanasi in which I fell down a crowded staircase of a hundred people. Sounds typical!